The final day of the 2017 ITTF Challenge Belgium Open was played out on Saturday 4th November as spectators in De Haan witnessed the final showdown for the four remaining trophies on offer. Here's a reminder of how Day Three unfolded. Four players returned to action for the semi-finals stage of the Men’s Singles competition with a place in the gold medal contest up for grabs. The top half of the draw saw the two unseeded Japanese contestants Yukiya Uda and Masaki Takami go head-to-head for a spot in the final, a feat which the latter player achieved with a five games victory over his fellow compatriot (8-11, 11-9, 12-10, 11-9, 11-7) while Korea Republic’s Kim Donghyun emerged successful in the other tie with a strong display against German opponent Ricardo Walther (11-7, 11-6, 11-8, 11-8). Masaki Takami has enjoyed a wonderful outing at the event and has been one of the standout competitors in De Haan. Starting his journey in the qualification tournament Takami defied the odds to reach the title match, however, there was to be no dream ending for the 18-year-old as eighth seed Kim Donghyun prevailed in the final by a four games to one scoreline (11-8, 13-11, 7-11, 11-3, 11-8) to lift the trophy. “I am very happy to win a title again on the Tour. During the whole week I felt great. I gained some confidence now to cause some upsets in Germany. 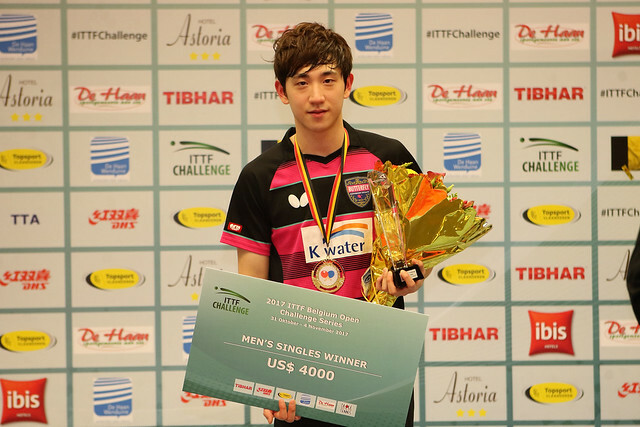 My world ranking will improve now; I hope I can still maintain this form a little longer”, Kim Donghyun. The Women’s Singles draw also resumed at the penultimate round of play with both fixtures favouring the lower seeded players. Saki Shibata was handed the difficult task of facing Hitomi Sato in the upper half of the draw, but a fantastic display of pace ultimately saw Shibata storm to a straight games triumph (11-7, 11-3, 11-5, 11-8) to end the no.1 seed’s title hopes. Awaiting the fourth seed in the final was Polina Mikhailova, seeded sixth, who extended her impressive run in De Haan with a fine effort against last year’s runner up Yui Hamamoto (11-7, 6-11, 11-6, 4-11, 11-8, 12-10). But, the Russian wasn’t able to replicate that result in the final, losing out to Shibata across five ends (11-13, 11-7, 11-4, 11-7, 11-8). “This title is really important for my career. Previously I won one Challenge tournament, this is the second. I hope to win a major tournament in the near future. My goal is to be in the top ten next year. I like Belgium; I might come back next year to defend my title”, Saki Shibata. Gold medals matches were also being contested in the two doubles competitions with partnerships from Germany and Japan claiming the rewards. Patrick Franziska and Ricardo Walther prevented the host nation from picking up a trophy, defeating the Belgian duo of Cedric Nuytinck and Robin Devos (11-5, 15-17, 11-8, 11-5) in the Men’s Doubles final. However, arguably the most dramatic final of the day came in the Women’s Doubles category as Japan’s Honoka Hashimoto and Hitomi Sato held off a late challenge from the Korean partnership of Lee Zion and Song Maeun (11-8, 12-10, 6-11, 11-13, 11-9) to seal the title.